As the third member, the ESCON 36/3 EC joins the one year ago launched series of maxon motor ESCON servo controllers. It captivates by user-friendliness and outstanding performance. Very well equipped, the miniaturised device demonstrates true greatness. Its special design allows the setup of cost-optimised drive systems solely using Hall sensor feedback (no encoder necessary) without waiving the comprehensive 4-quadrant operation capabilities. All of it in miniature dimensions and unrivalled power density. It is designed for efficient control of BLDC motors (brushless DC motors, so-called EC motors) with Hall sensors up to approximately 100 Watts. As part of the ESCON family, it represents the embodiment of unrivalled power density in the field of servo controller technology offering highest comfort, extensive functionality, and best protection. 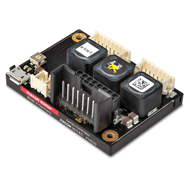 The ESCON 36/3 EC has excellent control properties and a very fast digital current controller with an enormous bandwidth for optimal motor current/torque control. The drift-free yet extremely dynamic speed behaviour enables a speed range of 0 to 150,000 rpm. The technological masterpiece provides a wide range of functions with fully configurable digital and analogue inputs and outputs and can be run in various operating modes (speed controller (closed loop), speed controller (open loop), current controller). It is perfectly matched to maxon’s range of motors and thus allows dynamic drive solutions that meet the highest demands. The compact servo controller is controlled by an analogue set value specified via analogue voltage, external or internal potentiometer, fixed value, or by means of PWM signal with variable duty cycle. Other interesting features are, for instance, the ability to enable or disable the power stage depending on the direction of rotation, or to use speed ramps for acceleration and deceleration. The speed can be regulated with Hall sensors. Top performance should not be a matter of practice makes perfect. Therefore the servo controller has been designed specifically with easy startup and user-friendliness in mind. Hence, no in-depth knowledge of drive technology is required. When the servo controller is connected to a PC via a USB port, it can easily and efficiently be configured with the graphical user interface «ESCON Studio». A large variety of functions, user-friendly software wizards, and a well-designed automatic procedure to fine-tune the controller come in handy during startup and configuration of the inputs and outputs, for monitoring, data recording, and diagnostics. As far as the hardware is concerned, the ESCON 36/3 EC comes fully equipped with everything that is needed. For example, no additional external filters or motor chokes are required. The ESCON 36/3 EC features protective circuits against over current, excess temperature, under voltage and over voltage, against voltage transients and short-circuits in the motor cable. Furthermore it is equipped with protected digital inputs and outputs and adjustable current limitation to protect motor and load. The motor current and the actual speed of the motor shaft can be monitored by means of the analogue output voltage. The wide range for input voltage and operating temperature allows a flexible use in almost all drive applications, in automation technology, in machine manufacturing and equipment engineering, and in mechatronics. With its exceptional efficiency of 95%, the inexpensive ESCON 36/3 EC is a first-class choice for mobile, highly efficient yet consumption-optimised applications. 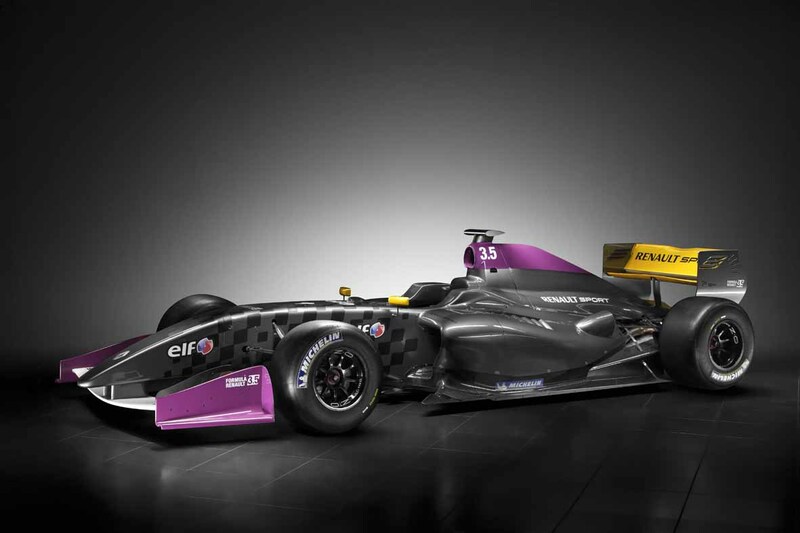 The Formula Renault 3.5 series, a very important feeder race championship for Formula 1. Many F1 drivers have graduated from the Renault series. Toro Rosso drivers Jean Eric Vergne and Daniel Ricciardo, and World Champion Sebastian Vettel to name a few. Race car and engine manufacturer, Zytek Engineering has been selected for the supply of the engine for the Formula Renault 3.5 series for the next two years with the Zytek engine which was designed in the UK. The Zytek engine is a 3.4 litre V8 producing 530 HP and 9250 rpm, an upgrade of 50 horsepower on previous years. Notably this year is a new fly-by-wire mechanism which uses DC servo motors from the Swiss manufacturer maxon, The DC motor and planetary gearhead combination has 3 position chart profiles selectable for changing track conditions. The new engine system and control has taken over 4s off lap times. The fly-by-wire servo system was specially adapted to meet the demands of the high vibration and high temperature environments. Aquabotix ROV with DC servo gearmotors for propulsion including androids and iPADs for control allowing a robot eye view of sea life. 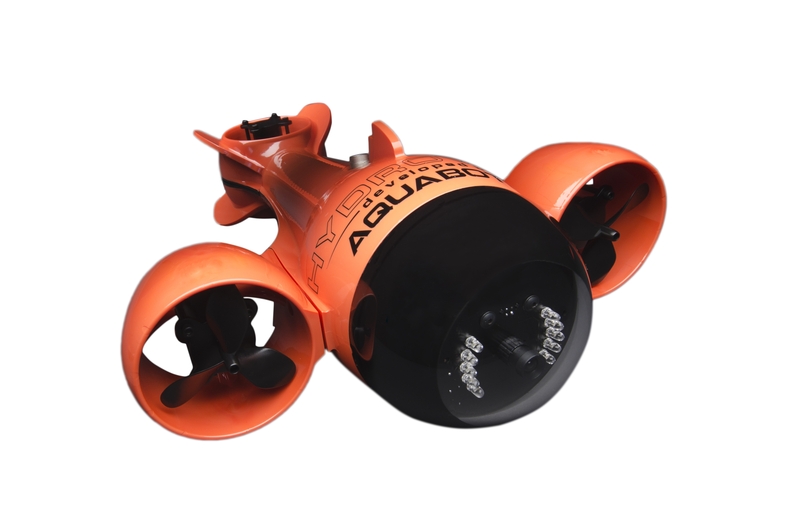 “emulating the ergonomics and kinetics of marine ecosystems” Designers from Aquabotix tasked with designing an intuitive and cost effective ROV with a live video stream. The resulting product was the HydroView. At 4.5kg supplied with an IP rated case and a 25m umbilical incorporating localised Wi-Fi communication from the pilot’s handheld device which is then connected to the ROV. FItted with Ultra bright LED lights and a High Definition camera for direct HMI. The ROV’s stability is naturally highly dependent on its control system. High accuracy control is also required to enable accurate video inspection information. This control is achieved with three propellers on either side and the rear. The propellers are driven by a separate permanent magnet brushed DC motor from Swiss manufacturer maxon motor. maxon’s A-max motors were selected for Because like all battery powered applications, maxon was also selected because they have a low mass and they are very efficient, allowing over three hours of operation. The motors also required a very low resonance so as not to cause premature failures of the sealing system. This low vibration requirement is magnified when the driveshaft is taken through a sealing system so the motors are custom designed with quite long shafts and a tight runout specification. With onboard Linux functionality it can be programmed in the users skill set language, including C or C++ however it also includes COCOA for iPAD. Android and PC versions can be programmed using Java. 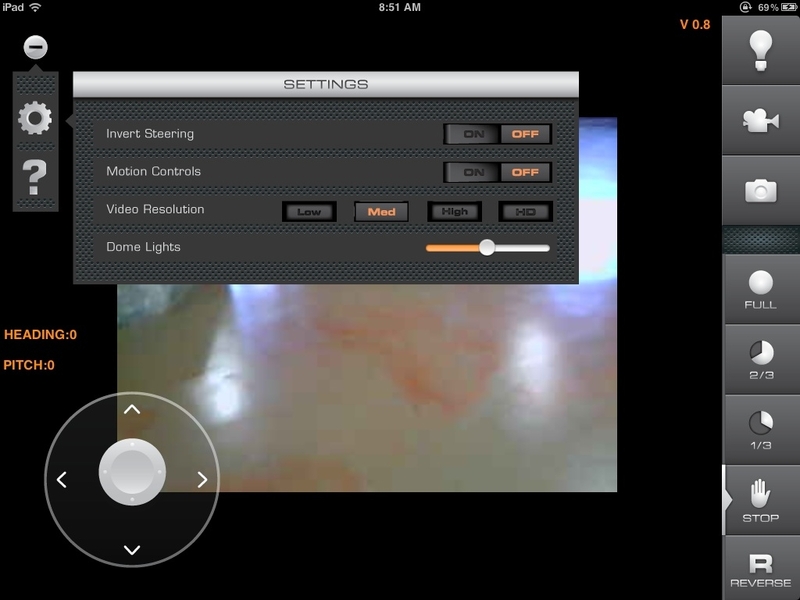 The Rov movement can then be controlled in a video game fashion using the handheld device accelerometers. 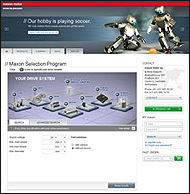 A new web tool by maxon motor, the leading provider of precision drives and systems, is now available at selection.maxonmotor.com. The “maxon selection program” (MSP) looks for appropriate drive systems that match the individual specifications of the user. In the simplest case scenario, the user only has to enter the supply voltage, the load speed and the load torque of the application. The MSP is seamlessly integrated into the online catalog and e-shop of maxon motor, which contains 2700 products (brushed and brushless DC motors, gearheads, sensors, controllers). This means the user can select and order the suggested drive systems online from anywhere in the world, around the clock. For drive specialists, the MSP provides an advanced search with additional parameters for specifying the load, drive, control and environmental conditions.